“When I started the painting, I had a completely different concept in mind. I had already sketched out my idea, put on my favorite worship music, and was about to apply the paint when the Holy Spirit interrupted and took over while I worshiped. I LOVE when He does that! What emerged was something quite different from my initial concept. I stood there and watched it unfold on the canvas, almost as if in third person. I can truthfully say that I am not the creator of this painting. I only held the brush. The door is in blood red. 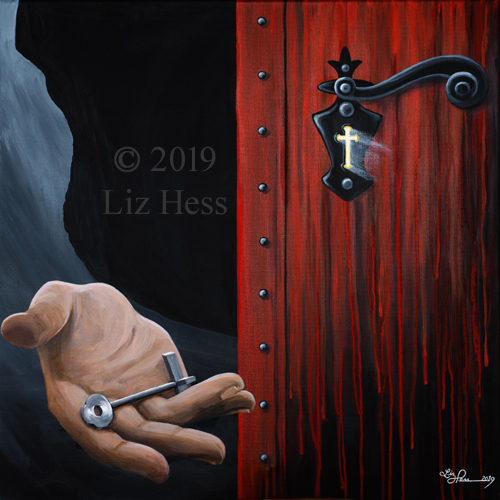 God’s shekinah glory shines through the cross-shaped keyhole while His hand beckons, freely offering that key (also in the shape of a cross) to unlock the barrier to the glory of His presence on the other side. We then enter by faith, represented by the shield-shaped lock (“Shield of Faith” in the Bible) and through the blood of the sacrifice made for us, given access right into the Holy of Holies. What an unspeakable privilege! Also available stretched and ready-to-hang (for pick up only) at Gallery: $450. To purchase this option, please call the Gallery.